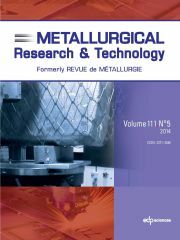 The journal publishes high-quality peer-reviewed research papers in the field of ferrous and non-ferrous metallurgy (nickel alloys, refractory steels, titanium, zirconium, etc.). It seeks to strengthen the dialogue between science and industry and emphasise the importance of technological innovation at a time when the metallurgy industry is challenged by issues surrounding energy, raw materials and the environment. The journal wishes to strengthen the dialogue between science and industry. This is why articles that focus on industrial practice, basic knowledge of metallurgy and review articles are especially welcome.